The Municipality of Zitsa has developed a Spatial Data Infrastructure, driven by the transition to a digital administration system, the development of added value services and the improvement of public services. A set of functions, that facilitate gathering of the available data and original urban planning material (diagrams, tables etc) within the administrative boundaries of the Municipality, is now available. The Spatial Data Infrastructure has been enriched with 2 new public service applications: Certificate request within or outside the settlement boundaries, Electrical Lighting System’s malfunction announcement application. The Spatial Data Infrastructure has potentially unlimited thematic and functional scaling capabilities. Besides the Municipality of Zitsa works constantly towards this direction, aiming at expanding the application’s content, and implementing a central point of information. 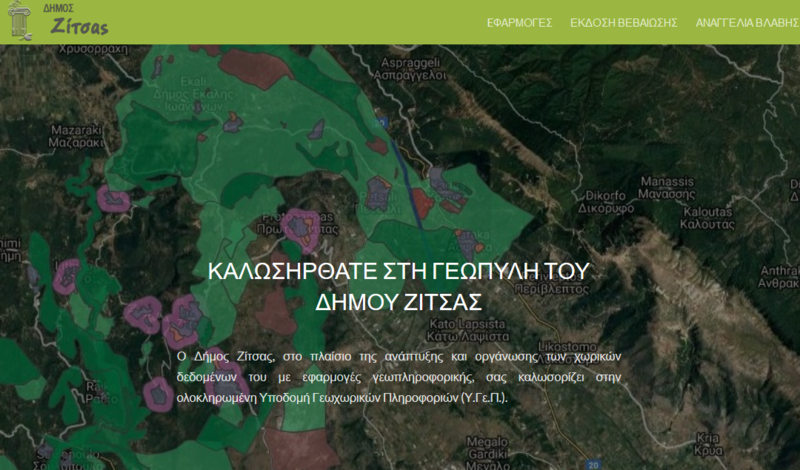 The application is in trial mode and can be accessed at http://gis.zitsa.gov.gr/.